Spud Nails: Red jelly glitter sandwich, anyone? 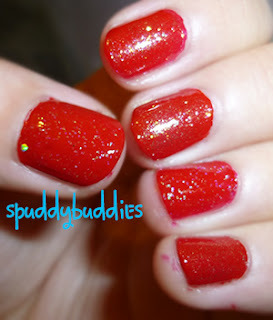 Red jelly glitter sandwich, anyone? Today's post is going to be short. 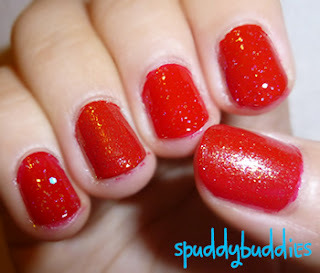 I did these nails a while back... before I bothered cleaning up the excess polish on my skin completely. Okay, so it's not exactly a jelly sandwich... It's more like crelly but... You be the judge. I used a red polish from The Face Shop (argh, can't remember the name/number off the top of my head) and Love & Beauty - Red (the pointer and ring finger) which I'm quite sure is a crelly (creme and jelly finish) and I was fascinated by that so I slathered on a micro-glitter topper and gold glass fleck glitter. I really liked this glitter jelly/crelly sandwich and I plan on doing this again sometime when I don't feel like doing nail art. 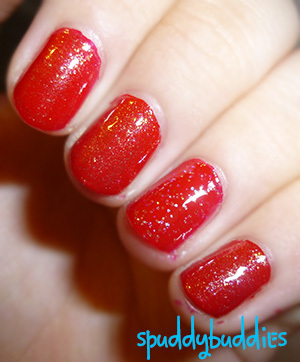 Are you into red nail polish?